This one-pot paprika chicken is a take on my mom’s memorable paprika chicken recipe. I have very fond memories of cleaning the whole bird and then rubbing it down with loads of paprika for weeknight dinners. The spice gives a deep rich color and imparts a delicious smoky flavor. This is my updated and modernized variation of mom’s simple recipe made into an easy one-pan meal. Oh, and find yourself some Castelvetrano olives — they are buttery with a bit of brine and are so addictive. Tip: If you can’t find the specified olives, substitute with the easier-to-find green manzanilla olives. This recipe is excerpted with permission from Samantha Ferraro’s new cookbook, The Weeknight Mediterranean Kitchen. 2. In a bowl, toss the chicken with the paprika and salt, making sure the spices evenly coat the chicken. 3. Heat a large skillet over medium-high heat and add enough olive oil to coat the bottom. Don’t add too much oil because the chicken will give off its own fat, as well. 4. Once the oil is hot, place the chicken thighs skin-side down into the hot pan and cook until a deep golden brown, about 3 to 4 minutes, and then flip the chicken over to the other side and cook for an additional 3 minutes. 5. Once both sides of the chicken are a deep golden brown, remove to a plate and set aside. 6. In the same hot skillet, add the shallot and sauté until lightly golden, about 2 to 3 minutes. Add the garlic and sauté for another minute. 7. Add the orzo and stir so it is coated in the oil and aromatics (this will give it great flavor). Use a spatula to even out the orzo. Add the chicken back into the pan, skin-side up, and pour in the stock. 8. 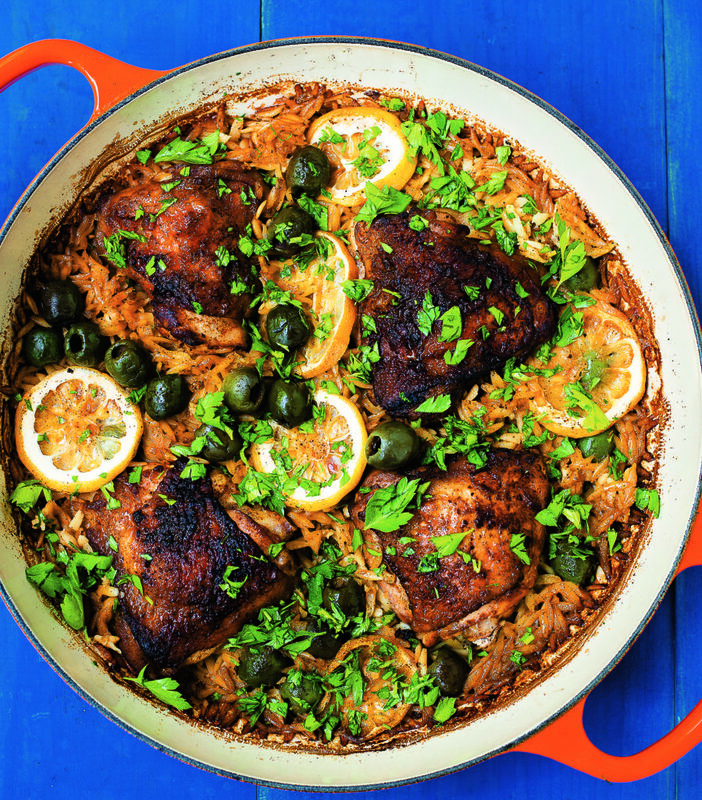 Scatter the lemon slices and olives over the chicken and orzo and place in the oven, covered, for 25 minutes. Remove the cover and continue cooking for an additional 12 to 15 minutes. 9. Once cooked, remove from the oven and garnish with parsley. Serves 2-4. Samantha Ferraro is the food blogger and photographer for The Little Ferraro Kitchen. Follow Samantha at http://littleferrarokitchen.com.